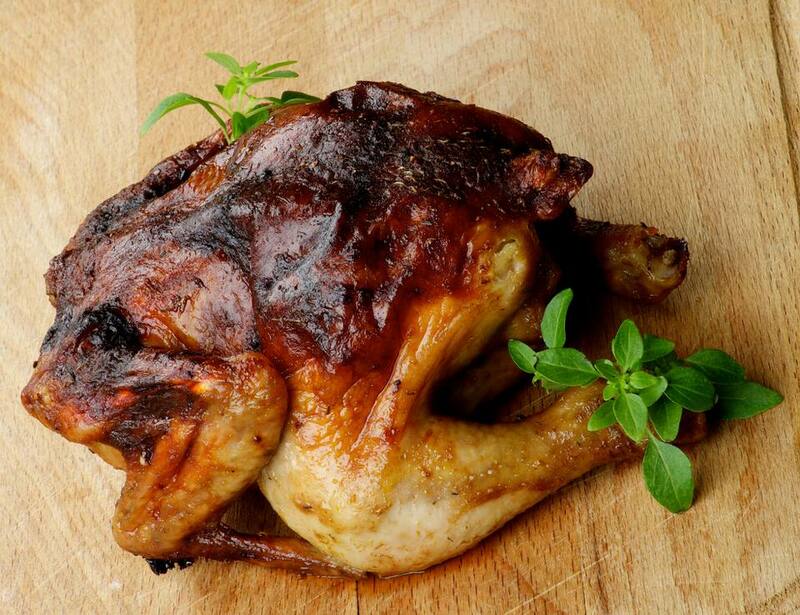 Here is another delicious rotisserie chicken recipe for you to try. The sweet sauce gives this dish an authentic Hawaiian flavor. You can serve this with grilled vegetables, like sweet potatoes or vegetable kebabs. Perfect for any cookout, special occasion, or family dinner. Combine all ingredients except the chicken and mix well. Separate out 1/3 of the mixture and brush over the entire surface of the chicken inside and out. It's best if you can get as much as possible under the skin, particularly over the breasts. Place chicken on rotisserie spit and grill over medium-low heat on the grill with a drip pan under the chicken. After 20 minutes of cooking time brush with part of remaining of the mixture. Repeat after another 20 minutes. Continue grilling until chicken has reached an internal temperature of 165 F in multiple areas, particularly the thigh area. Chicken should take about 1 1/2 hours to cook. Remove from heat and let chicken rest for 10 minutes before carving.